"Miss Universe." It's a title that evokes decades of pageant history. Miss Universe, which was founded in the early 1950s, is an internationally recognised beauty competition. The pageant traditionally takes place over a two-week period at the end of the year. During this time, contestants have a chance to prove themselves worthy of the title. Beauty, personality, and poise are all key factors that determine the final winner. The show includes competitors from up to 100 countries. Miss Universe is a long-standing tradition around the world, but an increase in body image awareness in recent years, combined with important conversations about the objectification of women that occurs in beauty pageants, has fuelled much controversy over these pageants. Miss Universe contestants are judged on their appearance in evening gowns and swimsuits as well as how thoughtfully they answer general questions about a variety of topics. Though the competition's "personality" portion may serve as a distraction from the "beauty" segments, even a judge admitted that contestants are mostly judged on their looks. To better understand how and when the standards of beauty for Miss Universe became disconnected from those of the average person, we reviewed images of winning contestants (1952–2015). The snapshots below, which reveal notable changes in Miss Universe's figure and pageant wear, may surprise you. The 63-year evolution of Miss Universe is an interesting one. The earlier days of the pageant were more conservative. Swimsuit styles, and thus body expectations, have changed drastically over the life of Miss Universe. Historically, the female image is often a reflection of the body standards during a particular time period. For example, the 1960s were the height of the sexual revolution – when women were becoming more empowered and expressing themselves like never before. Prior (in the 1950s), you’ll see full-coverage swimsuits draped on bodies more representative of the average woman. In the 1960s (and every decade afterwards), the layers gradually fall away from the contestants, revealing more (including their shrinking frames). By the 1980s, the contestants had more options to choose from – low-cut, strapless, and even bikini styles were seen. This same period was also a time of fit-body expectations – when supermodels were household names, home video workouts grew in popularity, and fat-free food hit supermarket shelves hard. In the timeline above, flat stomachs and toned arms are noticeably more present as the years go on. Throughout the years, there have been numerous Miss Universe pageant winners from a variety of countries. Click play on the morph video above to see how Miss Universe has evolved over the decades. Each country represents a slightly different beauty ideal. In 1971, Georgina Rizk of Lebanon won the Miss Universe crown. Rizk was more curvaceous than the previous winners in 1968 (Brazil) and 1969 (Philippines). The year before Rizk won, the crown went to Marisol Malaret of Puerto Rico, who was also markedly curvier than the women just two years before her. BMI was created by mathematician Lambert Adolphe Jacques Quetelet to measure the degree of obesity of the general population. Though Quetelet reportedly never expected BMI to be used to measure a person's health, it's often cited as a way of assessing whether or not an individual is of a normal weight and healthy – two factors that are not mutually exclusive. BMI, which stands for Body Mass Index, is calculated by dividing your weight in kilograms by your height in meters squared; the resulting number is meant to represent the measure of an individual's body fat. However, BMI is not an accurate measure of health, as it does not take into account factors such as age, gender, and muscle mass. It is important to note that while a low or high weight or BMI can negatively impact a person's body image, it does not necessarily mean that the individual is unhealthy. However, achieving a healthy weight improves general health and helps reduce the risk of certain health conditions. 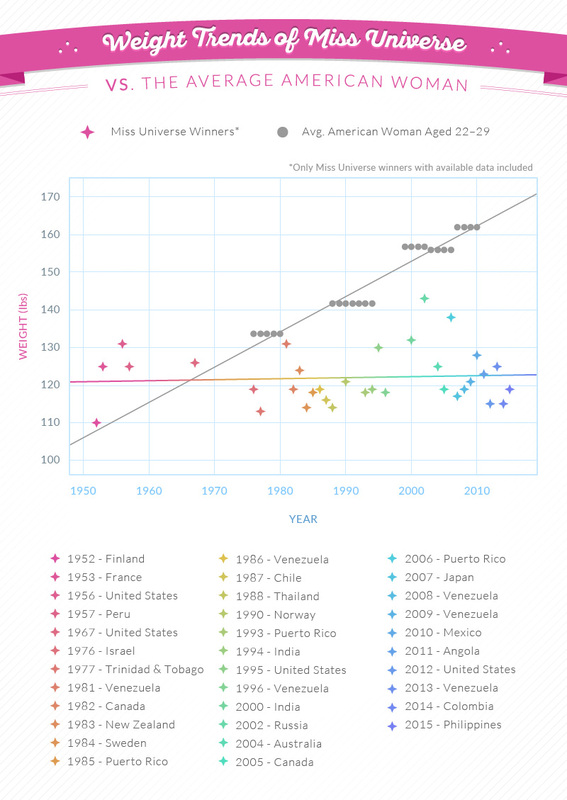 Though BMI is not a direct factor in the Miss Universe competition, the chart above displays the difference in the average woman's BMI and those of the Miss Universe contestants. According to the data available, contestants from France and the United States were the only titleholders with BMI values to chart alongside the average woman's BMI for their respective years, 1953 and 1956. 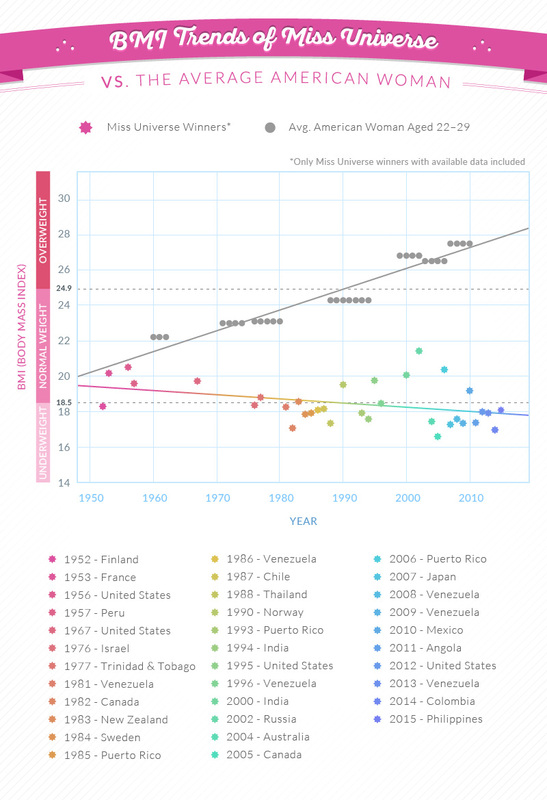 As the chart illustrates, the BMI of the average American woman has steadily risen, meanwhile the BMI of Miss Universe has gradually declined. 1990 marked a milestone: The average BMI for a woman in the U.S. moved from a normal BMI to overweight, which could lead to a higher risk of certain health complications such as stroke, type 2 diabetes, and heart disease. At the same time, the average BMI for a Miss Universe contestant dipped into the underweight range. For some women, being underweight can be associated with health issues such as a weakened immune system, missed periods, and a risk of osteoporosis. 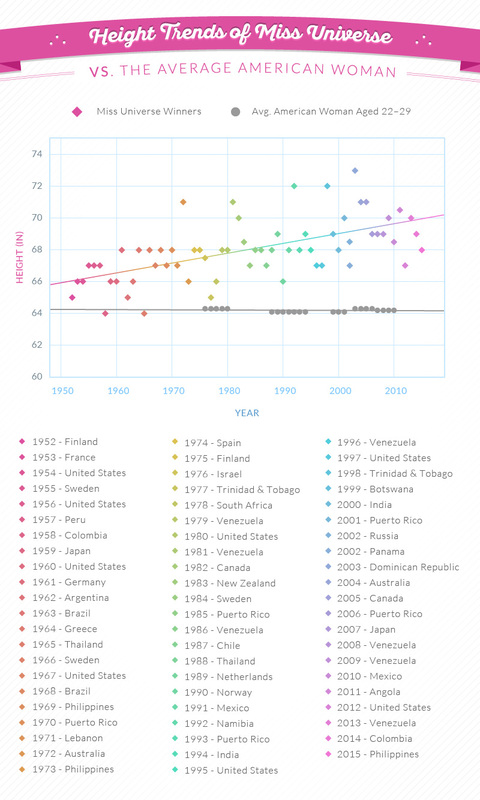 The growing disparity between the average BMI for a woman and Miss Universe's BMI is representative of two worrisome trends: firstly the rise in obesity, and secondly a falling BMI amongst Miss Universe contestants that could be representative of the pressure placed on pageant participants. Another troubling issue is the media's portrayal of unattainable beauty standards, which can promote poor self-image in women. While many factors have contributed to the increasing BMI of the average woman, poor body image may play a greater role than one might expect. In fact, a recent study showed that over a 20-year period from adolescence to young adulthood, teen girls with poor body images actually gain markedly more weight than their body-positive peers. It's clear that negative feelings do not trigger healthy behaviors. Now that we've tracked contestants' BMIs, let's take a look specifically at weight. The average weight of a Miss Universe contestant has remained steady over the course of more than 60 years, while the average American woman's weight has steadily increased. Since the competition's segments have remained the same (e.g. evening gown, swimsuit), the women who compete may rely on stringent workout regimens and diets to prepare for the pageant. Though the pageant guidelines state that "measurements are not considered," it acknowledges that judges look for evidence of physical fitness and proper body care and maintenance. Publicly judging a woman for how her body looks in a swimsuit typically implies that she needs to be of a certain size and weight in order to be attractive – something that does not necessarily promote positive body image for the average woman. When it comes to body image, height is another conversation separate from weight. Although people cannot change their height the way they can potentially change their weight, a woman's height can still negatively affect her body perception if the media or beauty pageants promote a particular height as the "ideal." Overall, the average height of a woman in any given country remains pretty standard; for example, the chart above shows that the average height of an American woman has not fluctuated greatly since 1950. However, the average height of a Miss Universe contestant has increased overall since the pageant's beginning. The Dominican Republic has produced the tallest competitor, a great outlier; whereas, Thailand and Colombia produced the shortest contestants in the early days of the competition. Unlike weight, height has steadily increased by three to five inches over the course of the pageant's history. Considering that BMI is a calculation of weight and height – contestants' increasing heights combined with little to no contrast in their weight – appears to be a likely reason that BMI has decreased over time. Though the average heights of contestants have increased, Miss Universe guidelines state that height is not a factor in the judging: "Whether you're 4' tall or 7' tall it doesn't matter," the guidelines state. There is plenty to unpack when it comes to Miss Universe's height, weight, BMI, and body issues. Miss Universe, and most other beauty pageants, often showcase unattainable ideals of beauty. Even without the pressures of Miss Universe – the societal pressures of the ideal body have fueled a steady increase in new cases of eating disorders, body dissatisfaction, depression, and other issues. Superdrug Online Doctor commissioned this study to spark conversation about an issue that affects all of us. By exposing how unattainable – and unhealthy – today's appearance standards are, we hope to encourage people to reconsider the true meaning of beauty, and strive for strong and healthy bodies . Our goal at Superdrug Online Doctor is to promote health and wellbeing over and above body ideals, and to empower people to be confident, regardless of whether they fit into perceptions of the ideal body. "Be Real shares the concern that people could see the images at Miss Universe and believe them to be a true reflection of how women should look, despite the fact that 95% of the population could never attain this supposed body 'ideal.'" "The impact of this perception is serious, with our own research showing that 42% of girls and young women feel the most negative part of being female is this pressure to look attractive." We compiled pictures and body measurements of Miss Universe winners from 1952 to 2015. (Note: Some winners did not have available images.) We calculated BMI for Miss Universe winners using available weight and height data. We obtained the average BMI, weight, and height for women in the United States, aged 20 to 29, from the Centers for Disease Control (CDC) for available years. This age range corresponds with the average age of 20.4 of all Miss Universe titleholders.